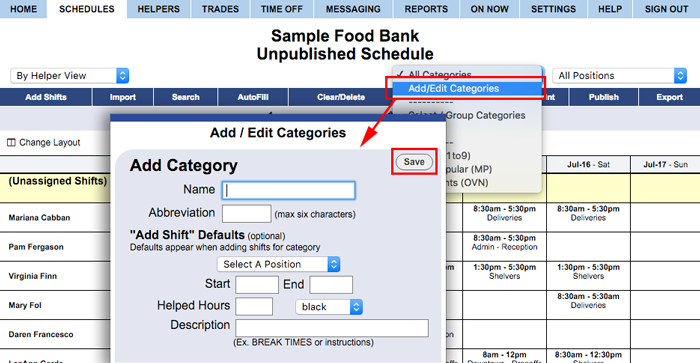 To use shift Categories, you must first create a new category name and abbreviation for each Category. Category default choices can also be added for use when Adding Shifts. You can set shifts into a Category when they are first added or you can set any existing shift to be in a Category. Shifts set to be in a certain category will remain in that category when imported into other weeks. For example, if you set 6 shifts to be in a category called "Night Shift" then when you import those shifts from that week into the following week, and they will still be in that Night Shift Category. Enter any default settings you like in the lower box - ex. times, shift color, description, etc. Now when you click on any Schedule View to Add Shifts and choose this Category, your default settings will be automatically entered for you (any of the default information can be changed by clicking and retyping).